When an Exchange Administrator wants to export the contents of individual mailboxes to PST format. In order, to move specific users mailbox items with PST format that is easily portable and ready to use with MS Outlook application. In Older Version such as Exchange 2007 / 2010, PowerShell Command and Exchange Admin Center can be used to export mailboxes of the user. But sometimes while these Commands, the process failed due to some corrupt items stored in Exchange mailboxes and may lead the disruption in the entire migration procedure. “I am running Exchange 2010 now, and when opened a PowerShell and used the Export-Mailbox command. It failed with ‘ This mailbox exceeded the maximum number of corrupted items’. I searched and learned about ‘BadItemLimit 50′ to export mailbox command. I did that limit and the export to PST then ran fine. But, when I open the exported PST file I find that it does not same to what I view in my mailbox utilizing MS Outlook 2007. More specifically, it shows to me like it includes a whole heap of old stuff that I have already deleted before. So, please suggest me an effective solution to exporting Exchagne 2007 mailbox to PST while skipping corrupted items. It is important to find the root cause first. That will prove beneficial in prohibiting this error from occurring again. Below are the prime causes that may trigger this error. If the Exchange 2007 itself has turned corrupt, it required to be isolated. This error occurs in such a case too. A corrupt mailbox has corrupt emails or its associated files. Such a mailbox is not offered to export. However, if any issues are faced while isolating such a mailbox, the server itself lead corruption. 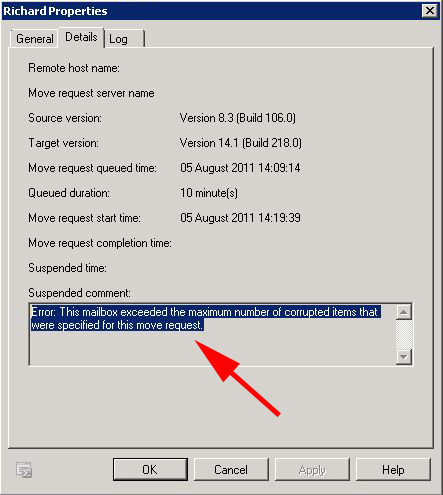 As the message shows that, if the number of corrupt mailboxes being export exceeds its set limit, this error occurs. The Exchange 2007 permits an only a limited number of corrupt mailboxes to be a part of the migration. Anyhow, if the actual number of corrupt mailboxes is exceeding the set limit, the migration procedure is paused midway. How Can I Handle Corrupt Items during Migration? 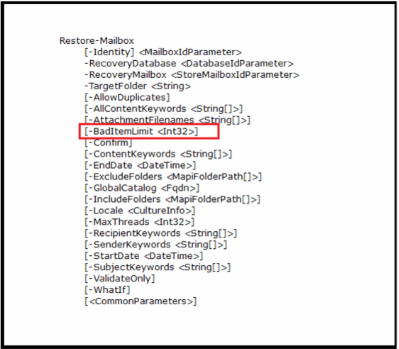 PowerShell Command enables Exchange Administrator to skip corrupt mailbox items to avoid error while migrating Exchange mailbox to Outlook PST format. For that use Parameter “BaditemsLimit” used to skip the corrupt items during the migration process. While Migration, this parameter helps Administrator to allow the bad or corrupt items but we need to provide a valid input with the bad item limit such as 50 or less if the number of corrupt items large in number then the process fails, to avoid that use “AcceptLargeDatabase” if corrupt items large then 51. If still, the process fails then, Exchange Administrator needs to repair the Exchange mailbox to export mailbox items into PST File format. For that, use the “Eseutil”, an inbuilt utility in Exchange environment. This Automated solution offered by SysTools helps Exchange Administrator to Export Exchange Mailbox to PST File Items without data loss. Utility easily searches Exchange mailbox within Sub-Domain. The Exchange export software is equipped with advanced technology. It exports Exchange Mailbox to PST format with same folder structure maintained as earlier. Step 2: Then, Add the administrator login Username & Password. 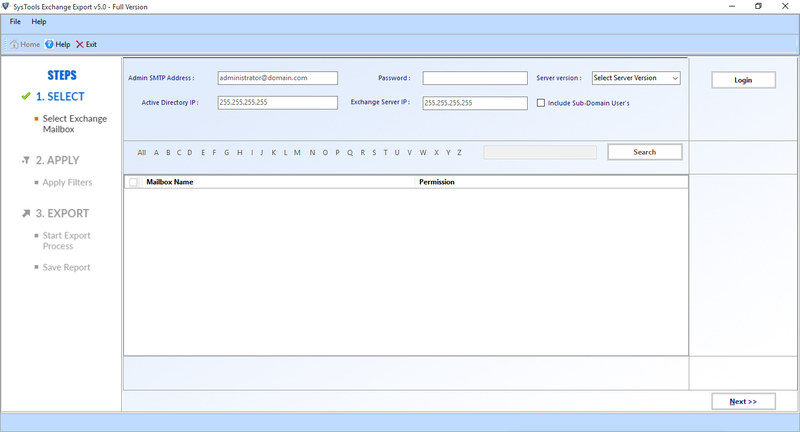 Choose the server version of Live Exchange Server and enter the AD IP or Exchange Server IP and hit on “Login” button. 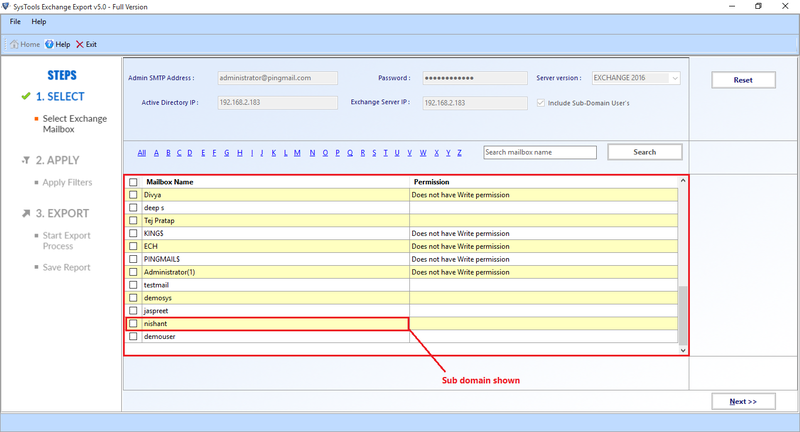 You can check the “Include Sub-Domain User’s” field if you need to export mailbox of sub-domain users as well. Step 3: Opt the mailboxes which you need to export using the checkbox corresponding to them and select the “Next” button. You can also check or uncheck the mailbox components which you want to export. 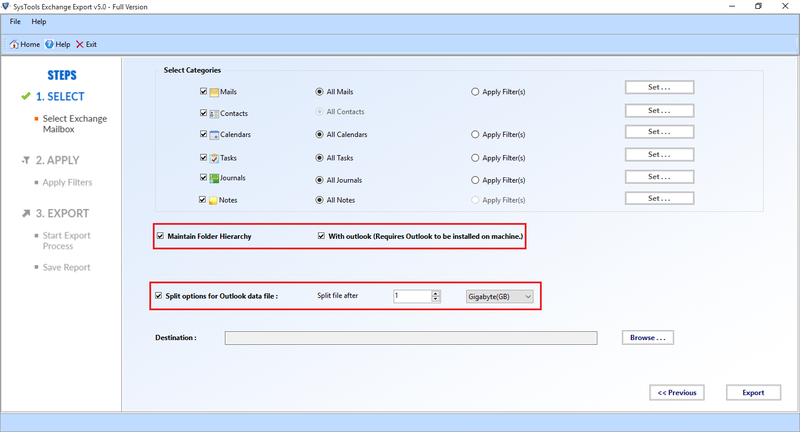 Step 4: Afterwards, you can opt “Advanced Settings” for successful Exchange to Outlook migration. Retains Folder Hierarchy- This option permits you to preserves the folder hierarchy of folders during the migration procedure. 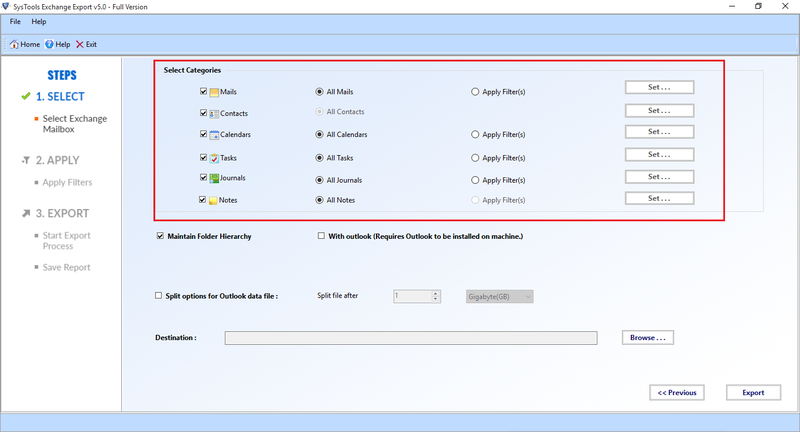 Split Outlook PST File- This feature offers you to split PST file after the mentioned file size. Step 5: Select the “Browse” button to choose the destination folder where you need to save the resultant data file. Then, hit on “Export” button to start the conversion process. Step 6: After completion of the export process you can save the export format by clicking the “Save Report” button. In Exchange Environment, the mailbox can be corrupted due to various reason and while migration those mailboxes exceeded the maximum number of corrupt item and process failed. To avoid this use parameter “Baditemslimit” and “AcceptLargeDatabase”. Exchange Administrator can also use “Eseutil” Command to repair the mailbox items and use Automated solution SysTools Exchange Export Tool to directly export Exchange 2007 mailbox to PST File format without skipping items.